GeckoPave® Acrylic Surface System is a PROVEN & GUARANTEED solution that adds back colour and reduces the risk to an athletes safety at your sporting facility. cracked & tired court areas and in turn improving an athletes safety”. Reduces the risk of injury to athletes ! 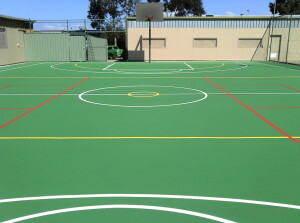 Gecko’s GeckoPave® Acrylic Surfacing is widely used on Tennis Courts, Basketball Courts, Netball Courts and Multi-Sports Courts. It provides a consistent and even playing surface with exceptional traction which in turn promotes athlete confidence and optimum performance. 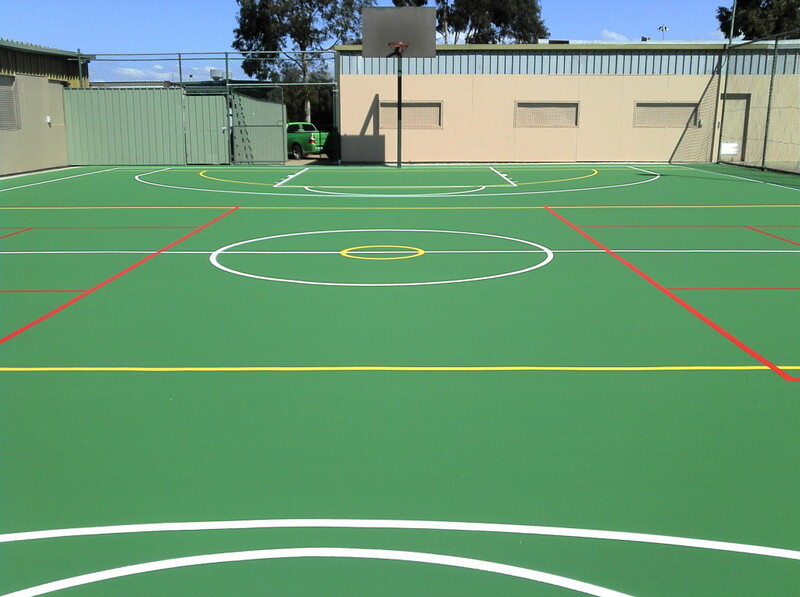 With GeckoPaves© Acrylic Surfacing system, you can eliminate those tired, nasty and cracked surfaces and replace them with an attractive, safe and functional playing surface. GeckoPave® is a very colourful solution with the option to create sections in bright fun designs to make your favourite patterns and games or even your organization’s colours. Rejuvenate those unattractive play areas with Gecko’s bright new acrylic surface which can be applied for almost any purpose. GeckoPave® Acrylic Surface is installed by qualified people who are trained to the highest level of competency. This eliminates any risk of poor workmanship at your organization’s facility. Gecko offers a guarantee unsurpassed by anyone else in the industry and at the completion of the project we provide a ‘Written’ guarantee for protection against both the installation process and the product. GeckoPave® Acrylic Surfacing System is guaranteed for 3 years. GeckoPave® Acrylic Surfacing System conforms to Quality Standard ISO 9001. To ensure a quality job you require a quality system, and Gecko certainly provides this in order to achieve our guarantee. The Multi-layer system of acrylic coatings consists of brilliant colour pigments and top quality polymers. GeckoPave® Acrylic Surfacing is an extremely low maintenance surface solution that continues to perform all year round. The maintenance required is generally no more than removing leaves or debris with a leaf blower or broom. GeckoPave® Colorcoat Concentrate is a 100% acrylic emulsion consisting of brilliant pigments and quality polymers that are blended into a highly concentrated form that is extremely wear resistant. Colorcoat Concentrate may be used for both the texture and finish coats and may also be applied to both asphalt or properly prepared concrete. Colours: Wide range of colours. The ‘Netball Attack® System’ has been purpose designed and formulated to provide a highly durable, all weather sporting surface with ‘maximum skid resistance’. Manufactured from selected premium 100% acrylic resins, light stable oxide pigments and proven reinforcing powders you can be assured that your investment will resist UV exposure and provide years of non-fade life. The specialised resins used in the production process provide excellent scuff resistance in both wet and dry conditions.